Pendant measures 1,77x 1,777 inches (45×45 mm) and hangs on 24 inches ( aprox 60 cm) black chain , and closes with a lobster clasp. Categories: Dragon Ball, Necklaces. 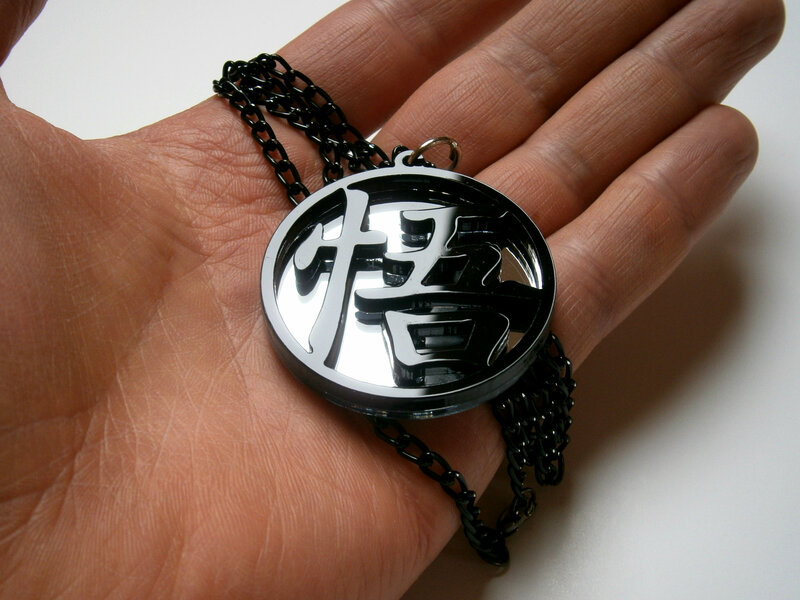 Tags: black acrylic, black chain, black necklace, dbz, dragon ball, geekery jewelry, goku, pendant. Pronounced Go (meaning “wisdom” or “enlightenment”) is the kanji that Goku adopts after his training in preparation for the upcoming battles on Namek. Goku continues to wear this kanji until the arrival of the Androids. This symbol is also on Goku’s house. Pendant measures 1,77x 1,777 inches (45×45 mm) and hang on 24 inches ( approx 60 cm) black chain, and closes with a lobster clasp.